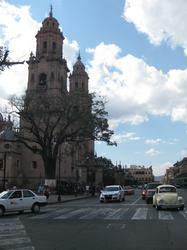 … but the best cold beer is in the late afternoon shade following a lazy day strolling around [[Morelia]]. Today began 2 nights ago at a [[CouchSurfing]] Camp when – sat around the camp fire – Chano agreed to host me. 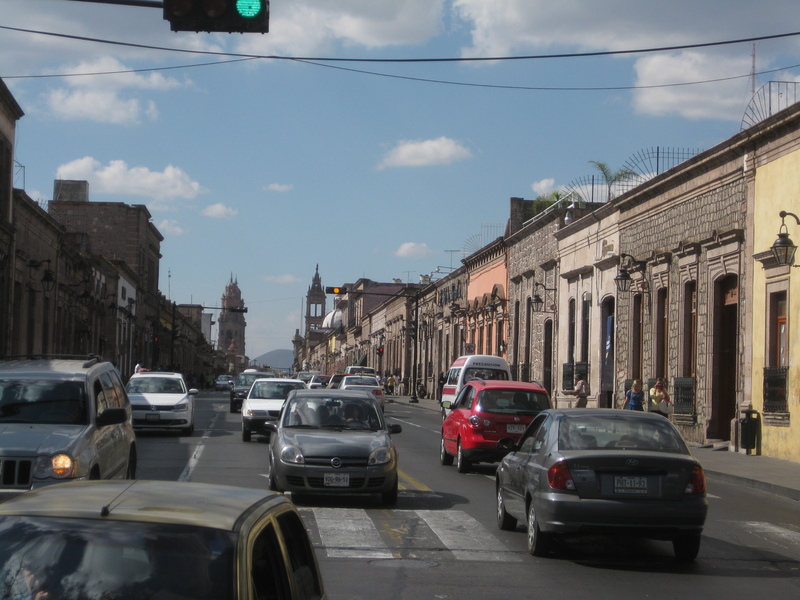 The plan was [[Guadalajara]] but when a Mandarin speaking Mexican invited you round you can reckon good things are in store. This morning began with someone wandering around the streets with a bell. I have no idea why*, he appears to have been going all night. After a quick email check (and a host confirmed in Guada!) 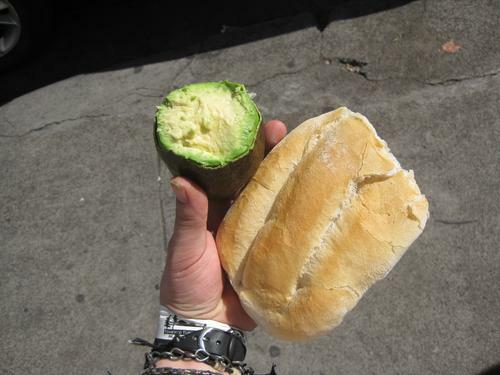 and a short browse on WikiTravel Morelia I headed to the market Chano mentioned for my stable breakfast – Avocado and fresh bread. * it turns out it’s the rubbish guy, Morelia is a city in which the council don’t collect any rubbish, so this helpful guy (and many others) are there to collect it for you (for a small fee) any time of day… or night. It didn’t take long to fall for this relaxed, happy and comfortable city. 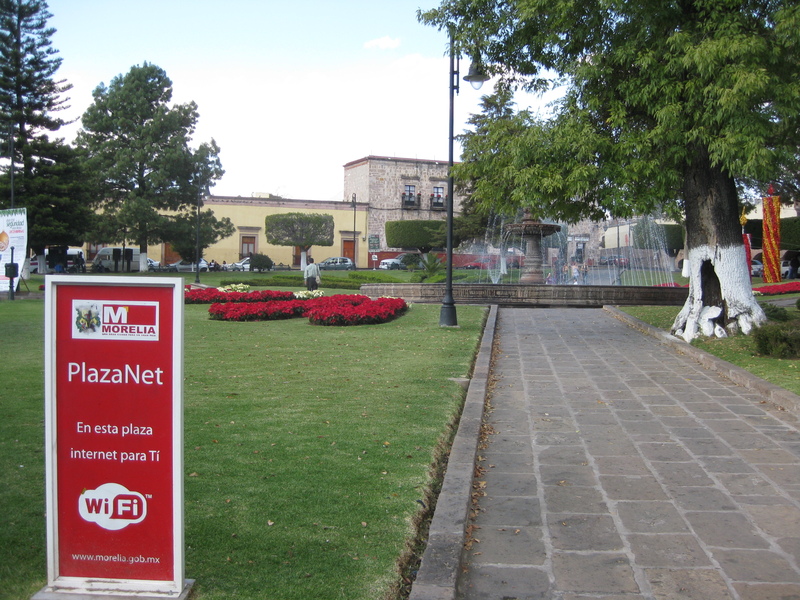 It”s huge (750,000 people) but ths historic centre is walkable and beautiful; and tourist orientated signs and maps abound! 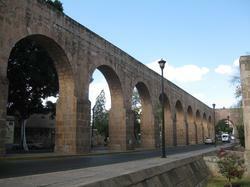 The first sight I came across was the aquaduct, originally built in the 17th centrury and made of hollowed tree trunks. After some map studying (I managed to forget my compass again!) in the Wifi Enabled Plazas I gleefully followed the aquaduct past the park to Plaza Morleos, who’s main feature is a statue which wouldn’t be out of place along [[The Mall]]. 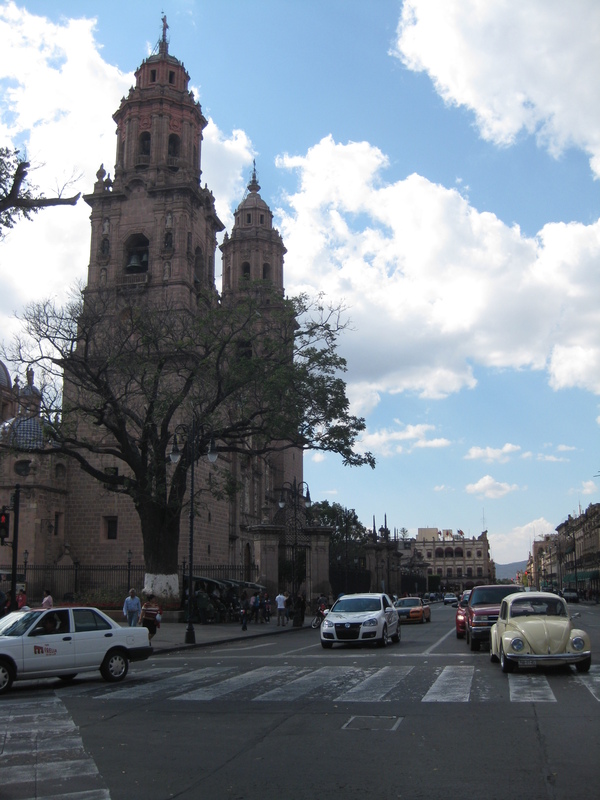 I watched some skaters having a photo shoot and fended off a sales person before heading into the church – >Santuario de Guadalupe. Brave looking explorers carrying a cross scout the hills, as the good Mary watches over them. Dark skinned children wearing feather skirts are taught by a veryt pale frair while a church is constructed in the background. An honourable guy intervienes at a human sacrifice while his buddy erects a cross next to a falling statue of [[Tlaloc]]. In front of a pyramid an [[Aztec]] fountain is used as a baptism font for the locals, now stripped of their head coverings hich lay discarded by the side. As is only natural given the location, it all looks very honourable. I’m here at a lucky time, the alter is being dressed for a wedding so the mexican red white and green hang from the arches and flowers surround the glistening, limp body of [[Jesus]]. Leaving, I headed back down Clz. Fray Antonio de Sab Miguel, usually I avoid walking the same path twice, but this was an exceptionally nice path. Wide enough for two lanes of cars but instead clear, clean and lined with trees and benches playing host to couples who are too busy adoring eachother to notice you path. 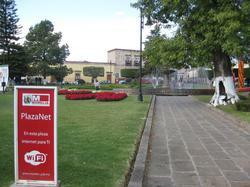 This walkway leads to the mentioned WiFi Enabled Plaza, which in turn leads to Toluca-Morellia. 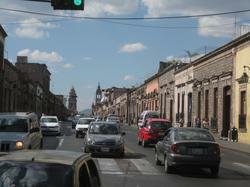 Toluca-Morelliais a very busy street, but the wide pavements and jolly shoppers make you easily forget the road and njoy the central street through town. 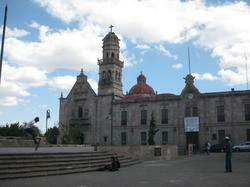 I can’t say I’m too impressed by the cathedral, though it would be hard to match Santuario de Guadalupe! It was dark (not that I mind them saving electricity) and much like other cathedrals. So I’ll mention a Mexican difference from England. Statues and shrines here tend to be behind glass or bars, rather than the openness of english churches and cathedrals. It makes them shiney, but more distant. Next on my list was Museo del Estado. After much wandering and some shamefully bad map reaqding I found it (behind the map). It was pretty good, if small and entirely in Sspanish, but closed at three (20 minutes after I entered). 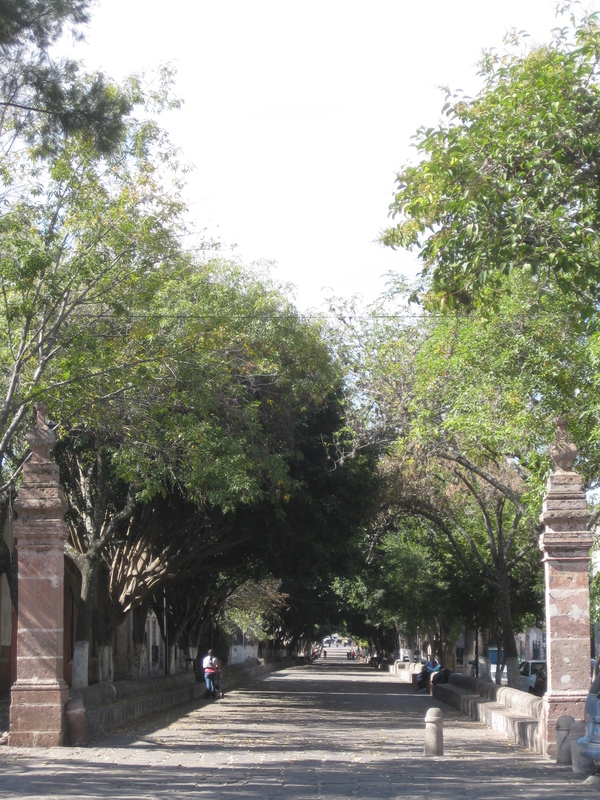 And so here I find myself, sitting in [[Plaza de la Rosa]] with two beers and a cool breeze carrying voices through the trees and a warm shady afternoon ahead of me.